After their greatest season in over 40 years City’s staff, players and fans were looking forward to a new season that would see Champions League football for The Citizens for the first time. A few days before the players returned to pre-season and amongst a plethora of transfer rumours City made their first signing as left back Gael Clichy joined from Arsenal for a modest fee of £7M, however even before the ink was dry on the young French defenders four year contract The blues were stunned by a statement from captain Carlos Tevez as he announced he must leave the club before the season starts, citing his need to be in a country where he can be with his children. The question was who could afford to buy him and pay his wages! Just a few days later the club, fans and ex players paid tribute to legend Mike Doyle at his funeral in Ashton Under Lyne, the former Blues captain and City’s most decorated player had tragically lost his fight against a liver disease at the age of 64 on 27th June 2011. 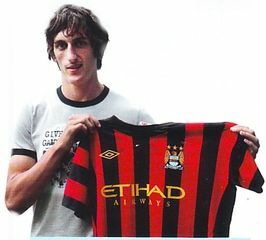 Roberto Mancini then again added to his defence by bringing in 20 year old Montenegro stopper Stefan Savic from Partizan Belgrade for a fee of around £7M. On the day the squad flew out to the US for a pre-season tour City announced a deal with Etihad Airways which included naming rights for the stadium and surrounding areas and an improved shirt sponsorship deal thought to total over £200M over ten years. Whilst the club were training in the US the first bid came in for Carlos Tevez from an unexpected country as Brazilian side Corinthians offered a reputed £35M for their former player, the bid was turned down as it did not reach City’s valuation. Patrick Vieira who had left City at the end of the season and announced his on retirement from the game as a player, rejoined the Blues backroom staff in a newly created role of Football Development Executive. With the prospect of first team football unlikely this season at City, 21 year old Ben Mee looked to gain more experience as he went on a season long loan to Burnley. city’s pre-season then got underway with two games in less than twelve hours, on home soil a young City eleven which also included Craig Bellamy, Nedum Onuoha and Michael Johnson beat Altrincham 2-1 at Moss Lane, then at 1am British time the US tour got underway with an impressive 2-0 win over Mexican side Club America in San Francisco. 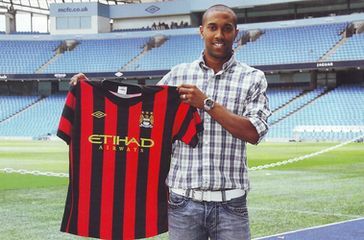 There was plenty of transfer activity back in Manchester with players moving away from the Etihad Stadium, Jerome Boateng got his wish to move back to Germany, however Bayern Munich had to pay around £13M to poach the young defender from City. Shay Given was also on the move as he joined Aston Villa for a fee of around £3.5M. City moved on to a very rainy Canada for the second game of their tour and on a sodden and dangerous artificial pitch The Blues beat Vancouver Whitecaps 2-1, but saw Yaya Toure worryingly carried off as he turned his ankle on the unplayable pitch. Carlos Tevez’s proposed transfer to Corinthians fell through as the clubs could not come to a financial agreement before the Brazilian transfer window shut, however another South American, Jo did leave for Brazil as he joined Internacional, there was no mention of a fee involved. A strong second stream City team then beat Stalybridge Celtic 4-2, before the senior squad finished their tour of the US as they drew 1-1 with LA Galaxy, as the American way the friendly was decided on ‘PKs’ Joe Hart grabbing the winner in a 7-6 shootout victory. Two players were then announced to be going out on loan for the season to Championship sides, Kieron Trippier to Burnley and Michael Johnson to renew his relationship with Sven at Leicester. 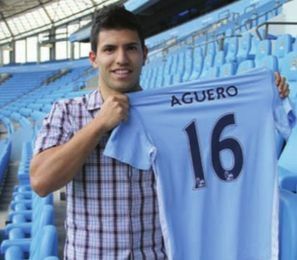 City then announced their intentions for the new season with a club record signing as they paid Atletico Madrid £38M for the services of the exciting 23 year old Argentinian striker Sergio ‘Kun’ Aguero. 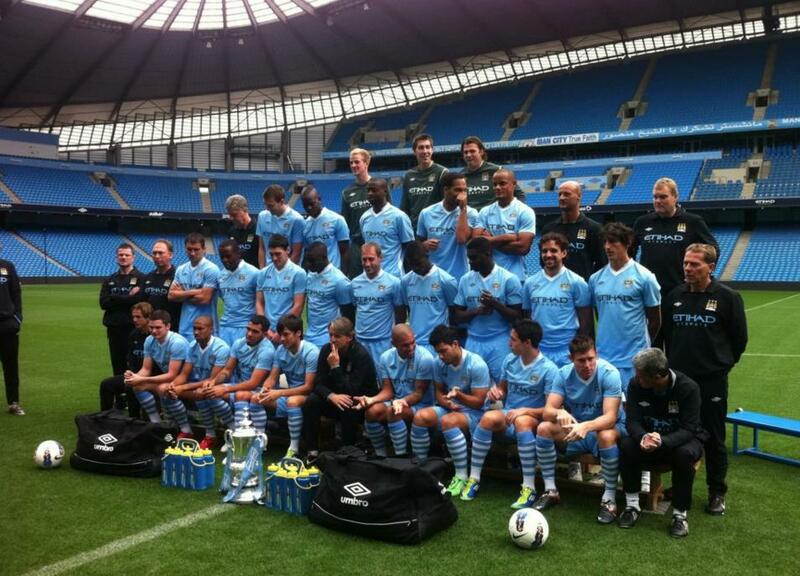 The Blues then took part in The Dublin Super Cup where they played two games in two days. Roberto Mancini picked a second string team for the first game against an Airtricity Irish XI which City won comfortably 3-0. The next day Mancini chiose his strongest side available and although it was only a friendly the Blues put up an impressive performance to beat Inter Milan 3-0 and to lift the first Dublin Super Cup. It was a third trip to Wembley in four months for City as they met Manchester United in the tradional season curtain raiser, The Community Shield, and although City led 2-0 at half-time United took the trophy eventually winning 3-2. And so the season started and City certainly put down a marker, as they beat Swansea 4-0, to go top of the league, with Bolton. City had 30 attempts on the Swans goal and Kun had the perfect debut as he came off the bench with less than 30 minutes left and scored two and made another with a headline making performance his father in law, Maradonna, would have been proud of. With both City and Bolton scoring four goals without reply on the opening weekend of the season they both sat at the top of the table and the two teams met at the Reebok where The Blues turned on the style again and won 3-2 to top the table with Manchester United in second place. Roberto Mancini had been openly chasing Arsenal’s Samir Nasri all Summer and with a week of the transfer window left he finally got his man, City paying the Gunners a fee of around £25M for the diminutive French midfielder. Out of favour Emmanuel Adebayor then joined Tottenham on loan for the rest of the season, Young belgian defender Dedryck Boyata also went out on a season long loan to Bolton. Samir Nasri made his debut at White Hart Lane in an amazing team performance that will be talked about for many years by City fans. The Blues tore Tottenham apart in a scintillating 5-1 win with Edin Dzeko scoring four goals to become the Premier League’s top scorer with six in just three games. 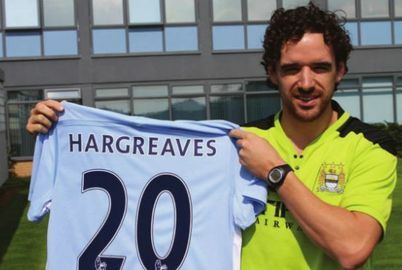 As the transfer window closed The Blues announced an unexpected signing when former England and Manchester United midfielder Owen Hargreaves joined City as a free agent on a one year deal. A two week international break followed and also the controversial resignation of Gary Cook as he became embroiled in an e-mail faux paus with Nedum Onuoha’s agent and mother Dr Anthonia Onuoha. City carried on after the international break with another entertaining performance as they beat Wigan 3-0 at The Etihad Stadium to sit equal top of the Premier League with Manchester United, both teams having taken twelve points from their first four games. And so to the the Holy Grail that is the European Champions League, as City met Napoli in their first ever game in the competition, an almost capacity Etihad crowd saw City draw 1-1. Back in the league and The Blues dropped their first points as they lost a 2-0 lead to draw 2-2 at Fulham. Roberto Mancini then gave his first team a rest and made eleven changes for the 3rd Round Carling Cup tie at home to holders Birmingham, and a very strong second string team won 2-0 with Owen Hargreaves scoring on his debut. three days later and 11 further team changes back to the strongest 11 in the Premier League City overcame their bogey side Everton beating them 2-0 in front of a home sell-out crowd. The UEFA Champions League then brought City their biggest challenge of the season as they played Bayern Munich at the Allianz Arena and lost 2-0, the defeat was overshadowed by the accusation by Roberto Mancini that Carlos Tevez had refused to come off the substitute’s bench with half an hour to go, the Argentinian was subsequently suspended for two weeks pending an enquiry. The Blues put their first defeat of the season behind them with an impressive 4-0 win at Blackburn in the Premier League, before the international break. City then issued a statement to say that their findings from Carlos Tevez’s investigatory had led them to believe that he had broken his contract and a disciplinary hearing was to be held shortly. After the international break City went two points clear at the top of the league as they beat Aston Villa 4-1 in an impressive display at the Etihad Stadium, David Silva picked up the Barclays player of the month award for September before the game, the same award had already been won by Edin Dzeko for August. It was a start to a history making week as just three days later City gained their first ever Champions League victory as a 93rd minute Auero goal at the Etihad Stadium gave the Blues a 2-1 win over Villarreal. A trip to Old Trafford folowed and possibly the greatest Derby win as City incredibly trounced United 6-1, A United defeat that Alex Ferguson described as the worst in his playing and managerial career. The win put City five points clear at the top of the Premier League and with an amazing goal difference of +26 after just nine games. The Carlos Tevez saga continued as City found him guilty of five charges as a result of his disciplinary hearing and announced they would be fining the Argentinian four weeks wages, however the PFA intervened and cut the fine back to two weeks wages. Roberto Mancini put off the field problems to the back of his mind and named a totally different starting eleven for the 4th Round Carling Cup tie at Molyneux, the new starters didn’t disappoint as they beat Wolves 5-2 to move into the Quarter-Finals. Back in the League it was back to the Mancini’s first eleven but the same opposition in Wolves and City beat them again, this time 3-1 to cement their five point lead at the top of the table. A great performance in Spain saw City beat Villarreal 3-0 in the Champions League to leave qualification for the knock out stages in their own hands, with Napoli away and Bayern at home to come. With four straight wins in the Premier League in October and in the process scoring 17 goals it was no surprise when Roberto Mancini picked up the Barclays Manager of the Month for October, and the victories carried on into November as City beat Queens Park Rangers 3-2 at Loftus Road to stay five points clear as they entered another international break. Further disciplinary issues were making the headlines whilst most players were away on International duty, first Carlos Tevez left the country to fly back to Argentina without the club’s permission and then failed to fly back for training, in addition City announced that Kolo Toure had been fined six weeks wages following his six month ban for doping offences. The board then announced a £195M loss for the financial year 2010/11, however any debt was cleared with the issuing of new equity by the Sheikh. The Blues then broke a Premier League record as they won their eleventh game out of the first twelve with a 3-1 victory over Newcastle in front of a record crowd for the Etihad Stadium. City travelled to Naples for the fifth game in their Champions league and unfortunately Napoli took qualification from the group out of City’s hand as they beat the Blues 2-1. City will now need to beat Bayern Munich in the last group game and hope Napoli don’t beat villarreal. in domestic football however City couldn’t be beaten, they travelled to Anfield and drew 1-1 against Liverpool in the league and then booked a place in the Carling Cup semi-finals beating Arsenal 1-0 at the Emirates Stadium. In their 14th league game City made it an amazing 48 goals this season with a 5-1 win over Norwich to keep a five point buffer over United. in the Champions League although City won their final match of the group, 2-0 at home to Bayern Munich, results elsewhere saw The Blues finish in third place in Group A and they would now be in the draw for the knockout stages of the Europa League. City then suffered their first defeat in the league, losing 2-1 at Chelsea, The Blues were now just two points ahead of their nearest rivals, Manchester United. In a home game where both teams contributed to a fantastic game of football, Mancini’s team disposed of Wenger’s Arsenal, 1-0. Then in one of the most one sided games seen at the Etihad, Stoke were demoralised as City won 3-0. City played just one game over Christmas, and the Boxing Day match at the Hawthorns saw City draw a blank for the first time since April as they drew 0-0 against West Brom, a result which guaranteed The Blues top position in the Premier League albeit on goal difference from Man United. Yaya Toure’s fantastic performances throughout 2011 were rewarded as he won the African Player of the Year award. New Years Day saw The Blues lose at Sunderland 1-0 despite dominating the game. Luckily rivals United lost as well and so City stayed top of the table. A great 3-0 home victory against Liverpool got City back on track. The transfer window was now open and City’s first piece of business saw Burnley complete the permanent signing of defender Kieran Trippier for an undisclosed fee. And although not leaving the club Yaya and Kolo Toure flew out to play for the Ivory Coast in the African Cup of Nations and would be sorely missed. An eagerly awaited 3rd Round FA Cup tie at The Etihad Stadium against Manchester United began controversialy as United took the lead in the 10th minute and two minutes later Vincent Kompany was inexplicably sent off for what only referee Chris Foy saw as a two footed tackle. The Blues seemed broken at half-time, 3-0 down and with just ten men, however in the second half they launched an amazing comeback, but couldn’t quite force a replay, losing 3-2. Three days later The Etihad Stadium was the venue for the 1st leg of the Carling Cup, and without the services of the Toure brother’s, Vincent Kompany, who’s appeal fell on deaf ears at the FA, and David Silva, who had picked up an ankle injury in the derby defeat the team struggled and lost 1-0 against Liverpool. David Silva was back in the team for a short trip to Wigan in the league and City controlled the game from the start and won 1-0 to stay two points clear at the top. Former captain of the triumphant 2008 FA Youth Cup winning side, Ben Mee who was on a season long loan at Burnley, made the move permanent after making just one senior appearance for the Blues. City then met Tottenham who were serious contenders to catch City at the top, however an amazing game ended 3-2 to City with Balotelli scoring the winning goal from the penalty spot in the last minute of injury time. However controversy is never far away for Super Mario and after the game the FA charge him with stamping on Spurs’ Scott Parker. 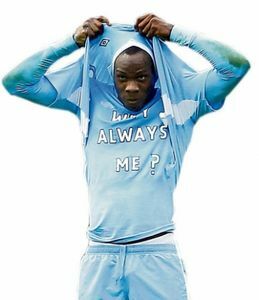 Mario pleads it was accidental and City officials believe referee Howard Webb saw the incident during play, although Webb denies this. City appeal but the FA will not listen and they impose a four match ban. More refereeing controversy followed in the Carling Cup semi-final second leg at Anfield, when Phil Dowd inexplicably gave a penalty to Liverpool in the first half for a ‘handball’ by Micah Richards when the whole world watching apart from the official saw it was accidental and should never have been given, Mr Dowd then conveniently missed a blatant foul in the penalty area on Edin Dzeko. City drew 2-2 with Liverpool and so were out of the Cup, you couldn’t help but wonder if there was an agenda against the Blues and Brian Marwood put in a request to meet with the the head of the refereeing Association for some clear pointers on refereeing consistency. Out of favour Nedum Onuoha was then transferred to QPR for a fee of around £3m, where he would link up with former City manager Mark Hughes who had just taken over the management role at Loftus Road. Wayne Bridge, who had also failed to impress Roberto Mancini, moved to Sunderland on loan until the end of the season. City next visited Goodison Park and lost 1-0 against ‘bogey’ side Everton, the race for the Championship was now hotting up, City were now only top of the league on goal difference with Manchester United now on the same points and Spurs five points adrift in third as we entered February. 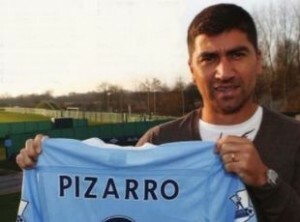 The only player brought in to the club on the last day of the transfer window was Chillean midfielder David Pizzaro who joined on loan from Roma until the end of the season. At a very snowy Etihad Stadium City made it 17 home league wins out of 17 to set a club record as they beat Fulham 3-0 and with United drawing moved two points clear of United with just over a third of the season left. A week later and The Blues kept the two point gap with a 1-0 win at Aston Villa. The day after Valentines Day there wasn’t much love from the City fans for the news that Carlos Tevez had eventually flew back into Manchester for a showdown with Roberto Mancini following his lengthy unauthorised hiatus in Argentina, however he would have to wait as City travelled to Porto in the 1st leg of the Europa League last 32 tie, and with Yaya Toure returning to the side after his African Cup of Nations appeareance, The Blues put up a strong display beating the Portuguese holders 2-1. Carlos Tevez then issued an a statement via the Official City website “I wish to apologise sincerely and unreservedly to everybody I have let down and to whom my actions over the last few months have caused offence. My wish is to concentrate on playing football for Manchester City Football Club”. He also withdrew his appeal against the gross misconduct charge imposed on him by the club. With debates aplenty going on as to whether Tevez should pull on a City shirt again, the players didn’t let the controversy affect them as they beat Porto 4-0 in the 2nd leg of the Europa Cup tie against Porto to progress to the last 16 with a 6-1 aggregate win. It was still tight at the top of the Premier League as City easily beat Blackburn 4-0 at the Etihad to keep the two point buffer with twelve games left to play. The Etihad continued to be a fortress as City beat Bolton 2-0, however The Blues were out of luck in the Europa League as they lost 1-0 against Sporting Lisbon in Portugal in the 1st leg of the Round of 16, more importantly defensive stalwarts Vincent Kompany and Joleon Lescott picked up injuries which could see them out for a few weeks. Without the defensive star duo The Blues lost 1-0 at Swansea and lost the position of first in the league for the first time in 2012, as Manchester United leapfrogged over City to lead at the top by one point. A dramatic second half comeback from 2-0 down to beat Sporting Lisbon 3-2 in the second leg of the Europa League tie wasn’t enough to stop the Portuguese side from progressing on away goals, leaving the Premier League as the only trophy left for Roberto Mancini’s side to fight for. City then broke the Premier League record for consecutive league wins, beating Chelsea 2-1 with two late second half goals to rack up 60 points out of a possible 60 points at the Etihad, the game was also significant for the return of Carlos Tevez, who came on as a second half substitute to a mixture of boos and cheers from the City fans. A hard earned 1-1 draw at Stoke followed and with rivals United winning City were now three points adrift of the team from Old Trafford with just eight games left to play. The team was now looking very leggy and hopes of winning the Premier League faded as The Blues’ could only draw 3-3 at home to Sunderland and then lost 1-0 at Arsenal to leave them eight points adrift of United with six games to play. It seemed the pressure was off as the City fans confined themselves to a second place finish, the players also seemed to be free of the pressure of the fight for the title as they impressively beat West Brom 4-0 at the Etihad and as the fans left the stadium they were bouyed by the news that United had lost at Wigan and therefore United’s lead had been cut to five points City were now playing the attacking football they had been renowned for in the first half of the season and they visited Carrow Road and destroyed Norwich 6-1, to stay five points behind United. The Blues then visited Molyneux, United had drew 4-4 at home to Everton just an hour before and City beat Wolves 2-0 which meant they were relegated, but more important City were now just three points behind United with a much superior goal difference, and with just three games to play the nation looked forward to the most anticipated Manchester derby in recent history. A record TV viewing ‘crowd’ of over 650M saw City play United off the park, a Vincent Kompany goal saw City win 1-0 in a game that United didn’t even manage an attempt on target and so the Blues moved to the top of the Premier League on goal difference. City’s penultimate game was a tough challenge as they visited St James’ Park to play Champions League qualifying wannabes Newcastle and YaYa Toure proved to be the big match winner again. The big Ivorian scored the first brace of his career to see City win 2-0. With United also winning 2-0 at home to Swansea the season was set for the closest finish to the title in Premier League history. In the week prior to the ‘final day’ City’s captain, Vincent Kompany received the Barclays Premier League Player of the Year award and Joe Hart received the Golden Glove award for the second season on the trot. The final day of the season arrived and the world watched on with anticipation. City were the odds on favourites to win the league as they were at home to QPR, who, themselves needed a draw to guarantee Premier League survival and gave the added impetus of having ex City players Joey Barton, Shaun Wright-Phillips and Nedum Onuoha in the team, and of course deposed City manager Mark Hughes in charge. United were away at Sunderland. Both Manchester clubs were on 86 points but City had an eight goal advantage over the team from Old Trafford. At half-time both Blues and Reds were wining 1-0, however QPR struck on the break twice in the second half and as City entered five minutes of added time they were 2-1 down. Dzeko, on as a sub scored an equaliser in the first minute of added on time and just as the final whistle blew at Sunderland, City were still drawing 2-2 and United players and fans began celebrating what they thought would be a 20th top flight success, however in the most exciting end to the Premier League ever, Sergio Aguero scored the winner for City in the 4th minute of added on time and City were Premier League Champions for the first time. At the final whistle at the Etihad the fans flooded onto the pitch to hail a truly memorable victory. 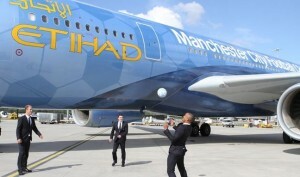 Once the crowd were cleared fittingly Mike Summerbee and Francis Lee brought out the Premier League Trophy and just like the changing of the guard the anticipated succession from the 1968 team to the 2012 squad was complete as Vincent Kompany lifted the Trophy and there was not a dry eye to be had in the stadium. The next day the team enjoyed a civic reception at The Manchester Town Hall ans a crowd of over 100,000 cheered on as the trophy was held high on an open top bus parade around Manchester city centre.